Objectives: Students will learn about the Spitzer Infrared Observatory and a recently observed dust ring around Saturn through reading a NASA press release and viewing a NASA video segment. Then students will use scientific notation to perform calculations to understand the size, mass, and volume of dust and the new dust ring. Common Core ELA for Science: RST.6-8.2. Determine the central ideas or conclusions of a text; provide an accurate summary of the text distinct from prior knowledge or opinions. RST.6-8.8. Distinguish among facts, reasoned judgment based on research findings, and speculation in a text. RST.6-8.9. Compare and contrast the information gained from experiments, simulations, video, or multimedia sources with that gained from reading a text on the same topic. Common Core Math Standard: CC.8.EE.4: Perform operations with numbers expressed in scientific notation, including problems where both decimal and scientific notation are used. Use scientific notation and choose units of appropriate size for measurements of very large or very small quantities (e.g., use millimeters per year for seafloor spreading). Interpret scientific notation that has been generated by technology. 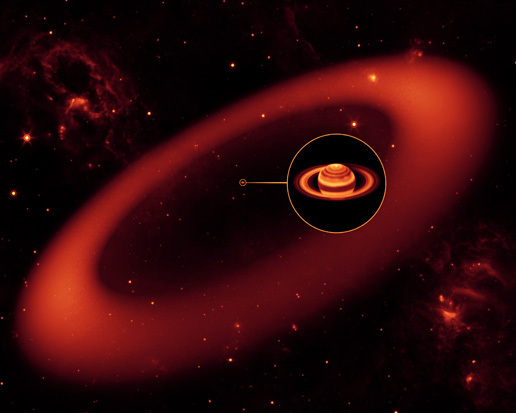 NASA's Spitzer Space Telescope has discovered an enormous ring around Saturn -- by far the largest of the giant planet's many rings. The ring itself is tenuous, made up of a thin array of ice and dust particles. Spitzer's infrared eyes were able to spot the glow of the band's cool dust. The telescope, launched in 2003, is currently 107 million kilometers (66 million miles) from Earth in orbit around the sun. Saturn's newest addition could explain how Cassini Regio came to be. The ring is circling in the same direction as Phoebe, while Iapetus, the other rings and most of Saturn's moons are all going the opposite way. According to the scientists, some of the dark and dusty material from the outer ring moves inward toward Iapetus, slamming the icy moon like bugs on a windshield. "Astronomers have long suspected that there is a connection between Saturn's outer moon Phoebe and the dark material on Iapetus," said Hamilton. "This new ring provides convincing evidence of that relationship." The ring would be difficult to see with visible-light telescopes. Its particles are diffuse and may even extend beyond the bulk of the ring material all the way in to Saturn and all the way out to interplanetary space. The relatively small numbers of particles in the ring wouldn't reflect much visible light, especially out at Saturn where sunlight is weak. "The particles are so far apart that if you were to stand in the ring, you wouldn't even know it," said Verbiscer.